Obama says Iranian allegations that U.S. behind protests "false and absurd"
WASHINGTON (CNN) -- President Obama sharpened his language on Iran and stressed the urgency of overhauling the health care system at a news conference Tuesday. 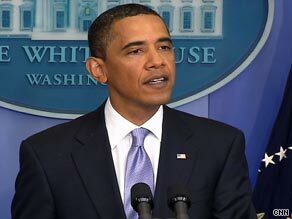 President Obama says his tone on the Iranian election crisis has been consistent. "The United States and the international community have been appalled and outraged by the threats, beatings and imprisonments of the last few days," the president said, adding that he strongly condemns "these unjust actions." Obama's Iran policy has received intense scrutiny amid growing concerns over Tehran's violent crackdown on street protests. The Iranian demonstrators believe the country's June 12 presidential election was a sham. Obama earlier called on Iran to stop violent and unjust steps that stifle free speech, but some Republicans have criticized him for not siding more strongly with the demonstrators. Obama also blasted allegations of some in the Iranian government that the United States is "instigating protests" as "patently false and absurd." "This tired strategy of using old tensions to scapegoat other countries won't work anymore in Iran. This is not about the United States and the West; this is about the people of Iran and the future that they -- and only they -- will choose." In what was believed to be a first, Obama's comments were available in Farsi, the main language of Iran, through a simultaneous translation on the White House Twitter link. Obama said the Iranian regime still has a clear, open path to international acceptance despite the violence of the recent crackdown. "There is a peaceful path ... to legitimacy," Obama said, and "we hope they take it." The president said Iran's "faith, sovereignty and traditions" can be accepted while the country's government nevertheless adheres to a set of "international norms and principles" regarding violence and the right of peaceful dissent. Asked why he wouldn't spell out any consequences, the president replied, "Because I think that we don't know yet how this thing is going to play out. I know everybody here is on a 24-hour news cycle. I'm not." On health care, the president said the status quo is "unsustainable" and defended his support for a public option. Overhauling the health care system is the president's top domestic priority, but the initial proposals to reach Congress last week received a rocky reception. The Congressional Budget Office determined that either of two similar bills written by Senate Democrats would cost more than $1 trillion, which was significantly higher than expected. At issue is how best to reduce the cost and increase the reach of the health care system, which officials say is draining personal, corporate and government budgets while leaving 46 million Americans without health insurance. Both parties in Congress agree on the need to slow the increase in health care costs while ensuring that all Americans can get health insurance, but they differ sharply on how to proceed. The biggest sticking point so far has been the idea of a government-funded public option to compete with private insurers. Republicans are adamant that such a step will lead to a government takeover of health care, which they oppose. Obama said Tuesday that having a public health insurance plan is "an important tool to discipline insurance companies" and will help control spiraling health care costs. Republicans have argued that a public option will drive private insurers out of business, and they accuse Obama and Democrats of trying to rush through what they say is flawed legislation before the midterm elections in 2010 and the 2012 presidential race. If that's the case, it'd be tough for private insurers to compete, Obama said. If, on the other hand, the "public plan must collect premiums and provide [good] services" like private insurers, then private insurers should have no problem competing with a public option, he said. Obama said he was hopeful that an efficiently run public plan could help push private insurers to make similar cost-cutting moves. The president also said Tuesday that he expects nationwide unemployment to exceed 10 percent this year, reiterating that the United States is in the midst of the worst economic downturn since the Great Depression. "I anticipate this is going to be a difficult period," Obama said. The president added, however, that he doesn't yet see the need for a second stimulus package. Obama noted he is not a daily smoker and "doesn't do it in front of" his children. The president argued that a new law providing for the Food and Drug Administration's regulation of tobacco "is not about me. It's about the next generation of kids coming up."